Product #21815 | SKU NADITBNC-FX | 0.0 (no ratings yet) Thanks for your rating! 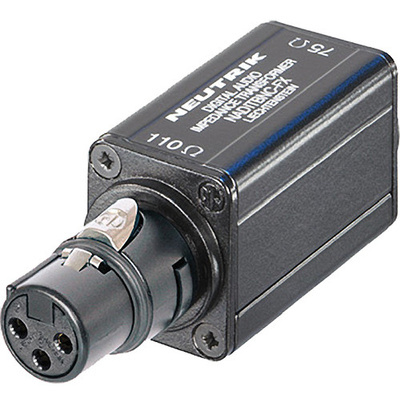 The Neutrik NADITBNC-FX Digital Impedance Transformer Adapter is a cost-effective impedance matching adapter that allows long cable runs for digital audio signals via low attenuation coax lines. The adapter features a female XLR cable end 110 Ω input to female BNC 75 Ω output.